This is a response to Where Were You During the #Flood, a piece written by 14 young Boston-area climate justice activists after September 22nd’s #FloodWallStreet action. I wasn’t at #FloodWallStreet. I watched it from above, on the 35th floor of an office building on Broadway, blasting out action photos and quotes on social media. I took this role because media support is important, and because I am on probation from getting arrested at a protest last summer. Getting arrested again would mean going to prison for a while, and this didn’t seem like the time to make that sacrifice. Before dawn on July 22, 2013, I walked onto a construction site owned by Enbridge, the company gouging the Midwest and Canada with tar sands pipelines. I was 25 miles from my hometown of East Lansing, Michigan. Lengths of pipeline lay neatly assembled, ready to be placed into the ground. Along with Vicci Hamlin, a grandmother and one of the sweetest people I’ve ever met, I attached myself to a huge earth-mover with a PVC “lockbox.” We stayed there for six hours, until the police cut us away from the machine and we went to jail. Vicci, two other women, and I ended up with felony charges for “Resisting and Obstructing Arrest.” The three of them bravely took their charges to court, and faced up to two years in prison when they were convicted. They were eventually sentenced to 40 days. I decided to avoid jail by pleading guilty, largely in order to follow-through with other movement-building commitments, including organizing a U.S. speaking tour for two African climate justice activists and planning a national convergence for the student divestment movement. My decision to take action, and then to plead guilty, is longer and twistier than I can tell here. I still have a lot of conflicted feelings about how it all went down. The experience helped me think deeply about direct action, sacrifice, and strategy. 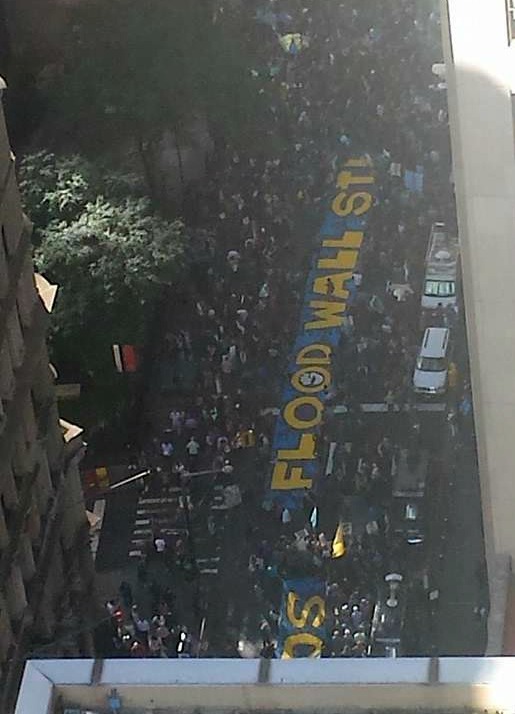 I appreciate all those arrested at #FloodWallStreet, and the points made in “Where Were You During the Flood,” for prompting us to think about these important questions. I unequivocally agree with you that we need a deeper level of personal sacrifice if we hope to succeed. My addition is twofold: (1) Supporting each other to make sacrifices will require a lot of skilled emotional work, and (2) Many more people will be willing to sacrifice if their sacrifices are in the service of a viable long-term strategy. Going to jail is an important and often necessary sacrifice, among many others. Other sacrifices include forgoing a comfortable income, becoming estranged from relatives, or working long hours for long years. Before many people can choose these sacrifices, they will need to access a deeper well of personal commitment to the struggle. This requires a spirit of challenge and support–challenging each other to live up to our values, and supporting each other to overcome our fears. This is a big part of my work with the Fossil Fuel Divestment Student Network, which seeks to challenge and support young people to make long-term commitments to climate justice, a sacrifice that may include but is so much more than going to jail. Finding the courage to make sacrifices is a long-term process, at the collective and individual level. I’m able to take action because of my personal work on these questions, both by myself and with the support of my community in the Maypop Collective, but I still have miles left to go. What movement practices can we develop – collective healing and emotional work – to invite more and more people into their power? Getting real about supporting each other to ask the deep questions will help us achieve strategic clarity around decisions related to sacrifice. Until then, too many of our non-sacrifices will be motivated by fear and hopelessness, and too many of our sacrifices will be motivated by guilt and self-destructiveness. Helping each other reach higher thresholds of commitment is only one piece of the puzzle. We also need to enhance our strategic clarity about particular actions and their role in the broader movement. I feel the power of this vision, but getting 3,000 people to stay would have required a very different action plan from the beginning. Action design and public messaging about the action shaped people’s expectations and influenced how people behaved throughout the day. 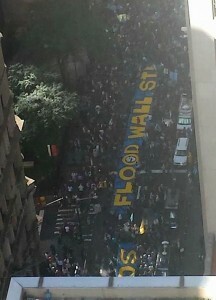 If action organizers had wanted an occupation, “Occupy the financial district overnight” would have been the stated action goal. Organizers would have sought stronger commitments from participants. More material support–blankets, tents, etc–would have been necessary. None of these things were in place, for the simple reason that the organizers of the action did not plan an occupation. The goals of the lead organizers–link climate chaos and capitalism in the public narrative of PCM weekend–were reflected in the materials and trainings leading up to the action. We were successful in meeting these goals, whether or not we agree with the scale of their ambition. For me to go to jail again, and possibly stay there, I would want to see that it was part of a viable long-term strategy for a just transition. Seriously, If I see a plan I believe in, and it involves me going to prison on Day One, I will be there. Or I’ll spend my life sweeping floors if that’s what the plan calls for. Whatever sacrifice is necessary. I’m there. And here’s the thing: I believe in our ability to craft a viable long-term strategy. It’s the only way we will win, and I know we can do it. I’m talking a 50-year plan, not a 2-year plan. Parts of the plan will be pre-determined, and other parts will emerge as we progress. It won’t just require escalated direct action. It will also require a lot of organizing, a lot of soul-searching, a lot of coalition-building, and a lot more. It won’t be any one of these things. It will be everything, together. I agree. Here’s my extension: “Proclaiming our solidarity, denouncing capitalism, and personal sacrifices are all meaningless if they are not connected to a viable strategy for a just transition to a better world.” As you say: we need to step it up. I’m disappointed that you linked people’s decisions in this particular action to their general willingness to sacrifice, which you then directly linked to our likelihood for success. There is truth in all of this, but there is so much more. These questions are too important to miss all that nuance. Most of all, though, I feel your hunger for a more committed and effective movement than we have now. I’m with you. Let’s learn what emotional work needs to happen, and what grand visions and strategies will support increasing numbers of people to commit to this work in the way we all desperately need.